Thread: Well, now what do I do? Ok, so last week I asked for help finding a pattern that was guy friendly for my husband. I FINALLY found the fabric I want to use, but couldn't pick a good pattern. So, I took all of your suggestions to him, with the fabric (which he loved) and then he said "Well, I don't really like patterned quilts." Outside of a crazy quilt I am not sure what to do! Bargello? The fabrics would look beautiful for one and if you just made you strip sets and started cutting random widths it would not be too "patterned". Or if you want to get really crazy ( and maybe a bit smarty pants) you could take that darkest brown and make a big square in the center. Applique or embroider the word BOX on it. Then take the other colors and create blocks that depict things he likes to do and piece them all around the box. Sadly, he thought the Bargellos were too girly. I thought for sure that would get him! Silly man. How about a Trip Around the World? ​Someone posted a picture of Bonnie Hunter's pattern Mountain Majesties they had made and it looked great. It is under Scrappy Mountain Majesties and done by dhanke. Maybe he could appreciate a block with a manly name like the Buzz Saw block. Last edited by Tartan; 06-20-2013 at 11:44 AM. I think any of the things on your list would be a great themed quilt. He will have to flex on fabric choices though to make them work. You could do an album cover type theme with his person 1980's playlist. Maybe even an entire "Trapped in the 80's" theme. There must be some mullet pictures in his background you could put on it. Maybe a storm at sea.... It doesn't have that quilt block look and would work well with the colors. Carpenter Wheel or Carpenter Star or Hunter's star would look good in a masculine way in those fabrics. You could do an extended log cabin. A log cabin block in the center and build outward. If you google Quilt Blocks Galore, there are a lot of patterns that you can extend outward with. Would be best if he could give some ideas. On second thought make a big bear and in the center and make some kinds of blocks to go around it until it is big enough. Put borders on it using all the colors in the quilt. How about a convergence type of pattern? You could use a panel and the solids and go for it. Does he like Minecraft? Those colors remind me of that game. When you were describing what he wanted, I thought of something like woody's cube blocks. I interpreted it as he does not want a traditional row upon row but a more modern feel. Maybe something more like Yellow Brick Road or Just Take Five or maybe a puzzle quilt? Let me see if I have pictures...okay, I do. They are in the order I listed, though the Yellow Brick Road called for twelve fabrics and I only used 6. Perhaps these may give you an idea of something??? He isn't being real helpful is he? Are you sure he even wants a quilt? You are more patient than I am, by this time I would of taken all the fat quarters and sewn them together. Uncut. Here ya go honey, no pattern - no problem. 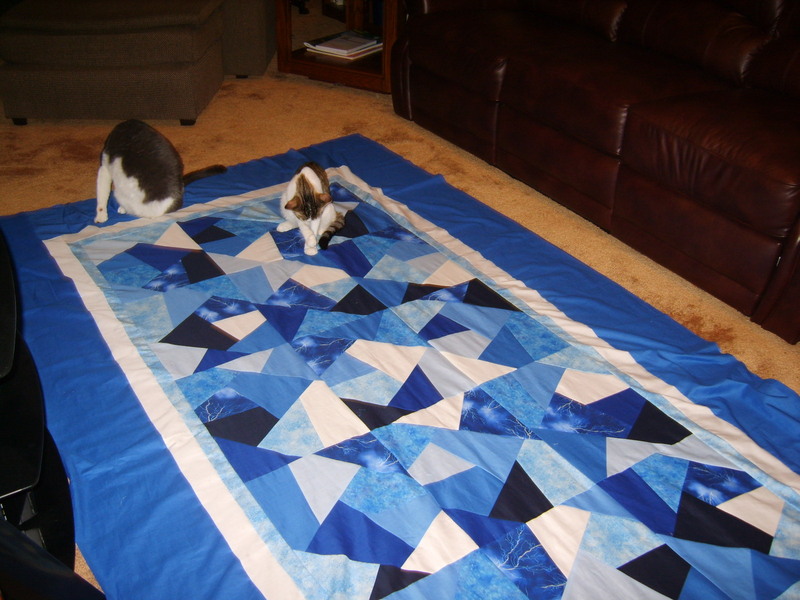 Since the FQs you have are solids, what about a modern quilt? The minimalistic look is big right now. Maybe if he looked at some pictures of green art quilts he could pin down what appeals to him. I made a quilt that was loads of fun, very creative, and everyone who sees it, loves it. It is the "About Trout" pattern put out by Lunchbox Quilts. I went to the website just out of curiousity and they have some lovely patterns that would play well with solid colors. Play up the lay out of the colors rather than the print of the fabric since you are using solids. 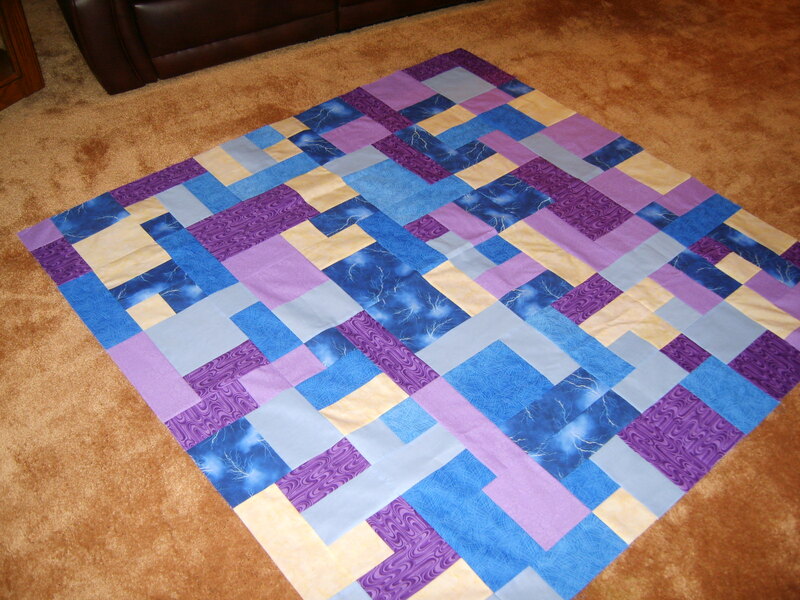 I love those graduated color quilts and some of those optical illusion ones which work so well with solid colors. There was a "to die for" maze quilt on here a few days ago that was solid colors and STUNNING! Be sure and let us see what you come up with. How about a modern design. With just a few coloured sections . Pity not one called jail house. Take a look at the Gumball Pattern sold by Stitchin' Heaven. I have made 5 of these. Easy easy pattern..not all from their kits. The pattern splashes color throughout the quilt. 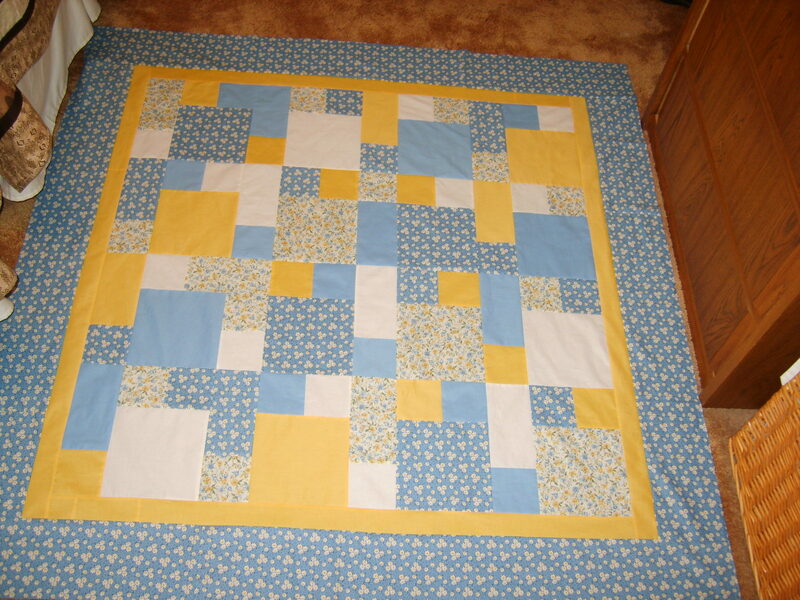 It is made up of 12 or14 inch blocks (can't remember) and shows you to turn the block as you sew them together. I didn't do that so much...on mine I made the objective to splash out the color evenly over the eye scan of the quilt. Most of mine were from batiks. Another suggestion is to look at some of the "modern quilt" patterns. They use lots of solids and "empty" space.